Dwarka also spelled Dvarka, Dwaraka, and Dvaraka, is a city and a municipality of Jamnagar district in the Gujarat state in India. Dwarka is one of the seven most ancient cities in the country.Dwarka is situated towards the western-most part of the Indian state of Gujarat. Located on the tip of the Saurashtra peninsula on the Arabian Sea, Dwarka was once referred to as the Golden City. The search for the lost city of Dwarka commenced in the early 1930Â’s. Archeologists of the Marine Archeology Unit (MAU) discovered the immersed township of Dwarka during their explorations which were conducted in 1983 Â– 1990. Nageshwar Mahadev, Rukmini Temple, Bhalka Tirth, Gomati Ghat Temples, etc. are some other popular pilgrim spots in Dwarka. Dwarka is also the seat of Adi Shankaracharya, who established four Â‘mathsÂ’ in four different parts of India. The Sharada Peetha of Dwarka is a famous research centre of Sanskrit language. Lord Krishna ordered Vishwakarma to build Dwarka. Dwarka was planned and built on the banks of Gomati River. The town had six organized sectors, like residential and commercial zones, wide roads, plazas, palaces etc and Sudharma Sabha hall was built to hold public meetings. It is said that the town initially had 700,000 palaces made of gold, silver and precious stones accompanied with beautiful gardens filled with flowers of all seasons and beautiful lakes. About 36 years after the Mahabharata War (3138 BC), Lord Krishna left the earth for Vaikunta according to Vishnu Purana. After Lord Krishna left the earth Dwarka was submerged into the sea. Dwarka Tourism - Get all information on Dwarka tourist places and sightseeing tours. Our website helps you plan your next tour and gives you great ideas on what to do, where to eat, where to stay and when to go there. We give the best information from the web to give you precise, meaningful and useful travel guide for leading places to visit in India and from across the world. Our travel information on DWARKA tourist places, tourist attractions, major sightseeing, the best time to visit, the top places to visit in Dwarka, the must-see things to see and do, maps, restaurants, hotels, nearby tourist destinations, local public information and more. 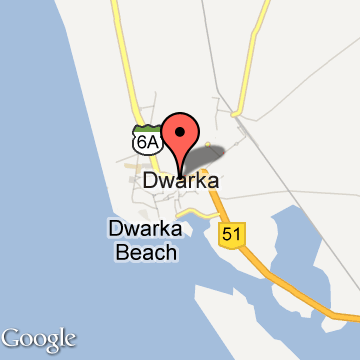 To start with check out information on how to reach Dwarka.